There are many carrot cake recipes out there. And it’s hard to decipher which one to pick – since they all seem pretty similar. 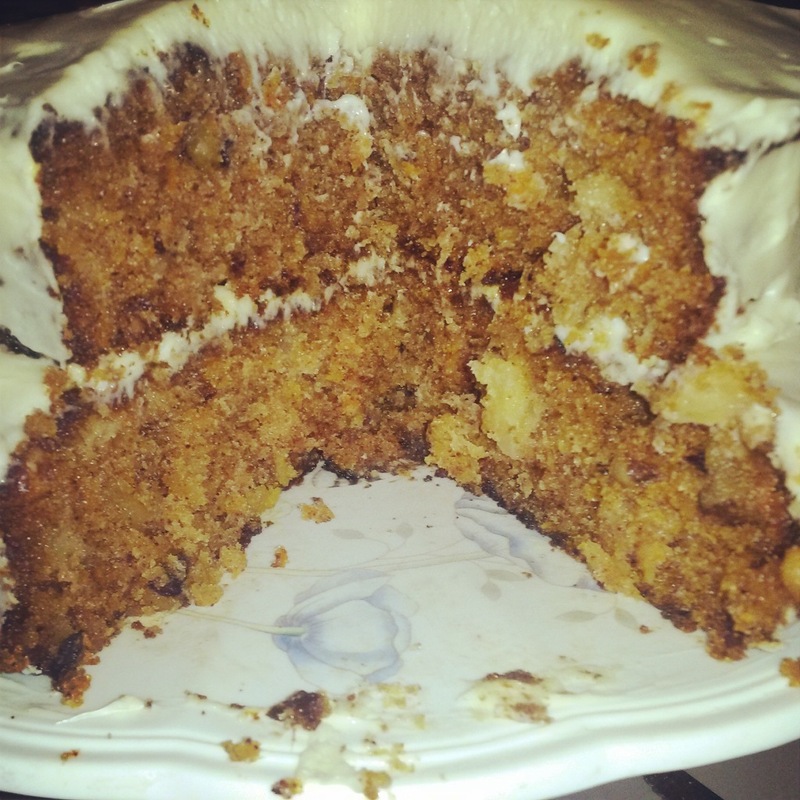 Your quest is over – this is the best carrot cake recipe and all you will ever need. It can’t be messed up. It tastes delicious. The cake is light and airy and a real crowd pleaser. And thanks to its many wonderful qualities – and to the person who shared it with me – it even deserves a yoga breath of satisfaction. 2. In a large bowl, beat the eggs. Slowly add the sugar, oil and vanilla and beat to combine. 3. Slowly add the dry ingredients (flour, baking powder and baking soda) and beat to combine. 4. Stir in the nuts and pineapple. Then stir in the carrots and cinnamon. a large baking pan (probably 9×13 – I have done this in the past and it also works great, especially if you don’t want to make a layer cake which, trust me, takes some extra steps that I wasn’t so good at). 6. Bake the cake for about 45 minutes or until a toothpick comes out clean. Allow to cool before frosting. 7. To make the frosting, combine the butter, cream cheese, sugar and vanilla in a large bowl. Beat the ingredients together with a hand mixture until fully combined and whipped up slightly. 8. Frost your cake**: If you made the cake in a baking pan, easy! 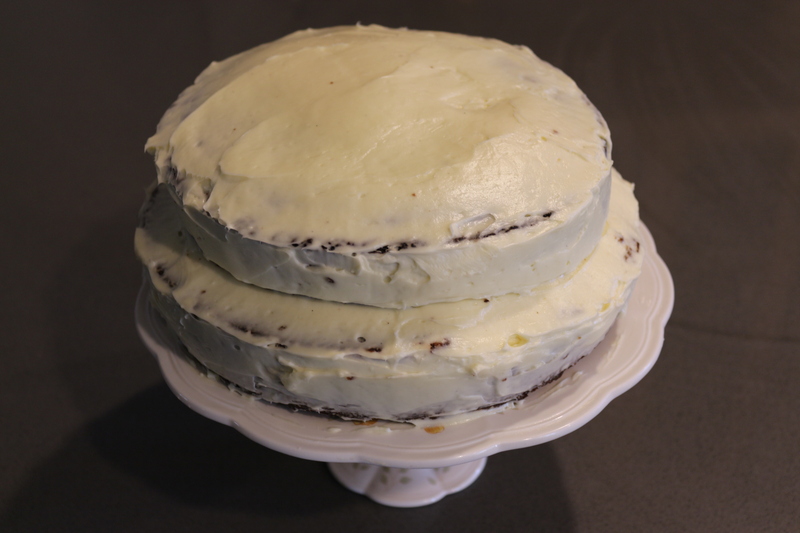 Just spread as much of the frosting as you want over the top using a spatula and dig in! If you made a layer cake, you need to remove the layers from the pans first. Then, place the first layer on a plate or cake stand. Spread some frosting across the top. Place the next layer on top of that. Spread a lot of frosting across the top of that one. Then, frost the sides too if you want. If your layers don’t come out perfectly from the pans, that’s okay. First, Patrick liked it because he got to eat the stuck parts out of the pan. Second, just put more frosting to fill in the holes when frosting the cake, and whomever eats that piece just gets a lucky jackpot of frosting. Frosting the tops of the layers is pretty easy. Frosting the sides is harder. I learned to put more frosting than you need. Get it spread all around. Then, grab a butter knife to smooth it out at the end so it doesn’t look like a 5-year old frosted your cake (no offense to the kids out there). As you smooth, some frosting will come off, but the cake will just get prettier. 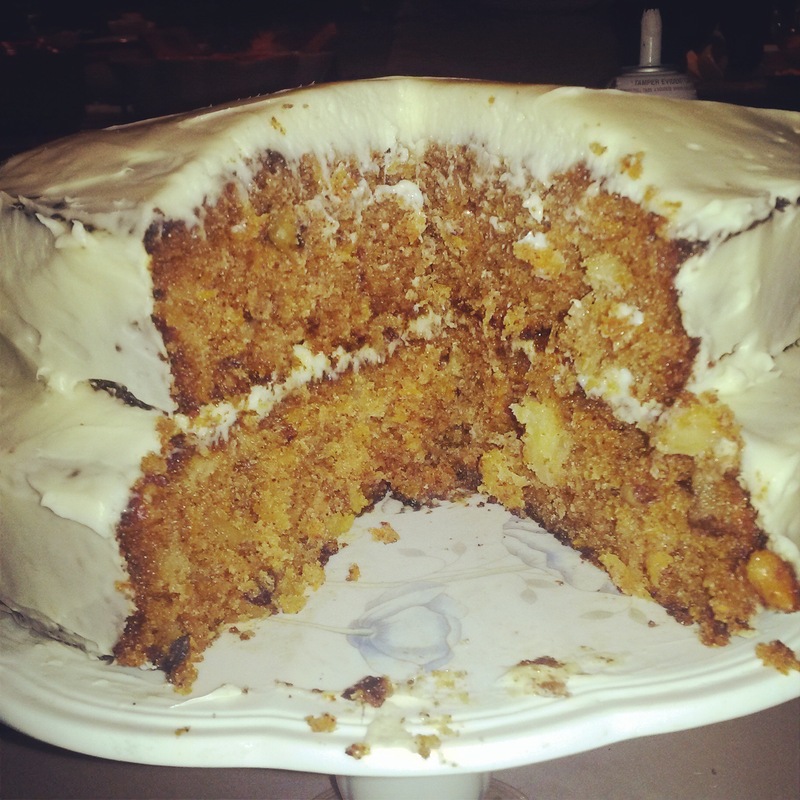 This entry was posted in Sweets and tagged Carrots, cinnamon, Vegetarian. Bookmark the permalink.